Versatile new features contribute to an outstanding update. Mocha Pro enhances its already robust toolset with a versatile range of essential new features that you’ll definitely want to use for everyday tasks. For version 6 of Boris FX’s planar tracker, roto-masking and visual effects tool, there’s a new naming convention (named by the year) signalling future major releases will be annual. 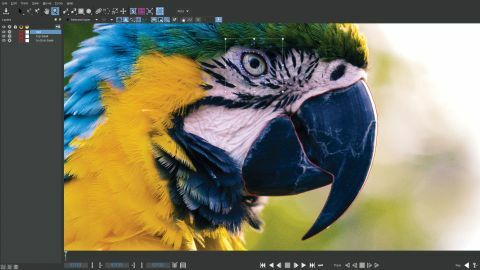 The first thing you’ll notice about Mocha Pro 2019 is the redesigned interface and addition of four workspaces. Designed for newcomers, the default Essentials workspace presents a simplified layout that’s streamlined to focus on the bread-and-butter tasks of tracking and roto. Existing users will be at home with the Classic workspace. There’s also Roto and Big Picture workspaces, so you can pick the one that suits your 3D art workflow. Sadly there’s no option to create your own custom workspaces. The interface has been tweaked, becoming darker and a lot sharper as Mocha Pro has got better at taking advantage of high-DPI resolution screens, including Retina displays. To expedite roto work, new spline tools have been added that you’ll soon come to rely on. For quick garbage mattes, the Freehand spline tool is a useful timesaver. It lets you click-drag draw a loose shape that’s converted to an X-spline on completion. To increase or decrease the amount of tangents generated, there’s a Detail parameter. Similar to Photoshop’s Magnetic Lasso tool is the new Magnetic Spline tool. It reduces the amount of clicks needed as you simply trace an outline around the edge of the area you want to roto. Should the magnetism get confused when tackling difficult areas such as blurred edges, simply click to manually add anchor points until you get back on track or you can click-drag to temporarily switch to the freehand tool. Generally speaking the resulting X-spline tangent handles will need a fine-tune. Ellipse and Rectangle roto shapes have also been added. Mocha’s Remove Module, which is used to track and remove objects from shots, is now enabled for Open CL-based GPU acceleration to give a significant rendering speed boost compared to using only processing power. During reviewing, the speed increase is obvious and Boris FX has benchmarked rendering speeds that can be up to four to five times quicker, depending on hardware. VR artists can also take advantage of the GPU-accelerated Remove module and new roto tools as Mocha VR (Boris FX’s toolkit for spherical 360/VR video post-production) has been merged into Mocha Pro as a standard feature. The focus on faster and more efficient working – specifically with Mocha’s core tools, coupled with the addition of Mocha VR without a price increase makes this release excellent value. This article was originally published in 3D Artist magazine. Read more: The best new 3D tools for 2019.